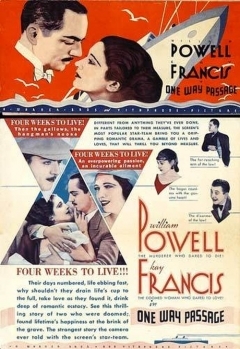 When a condemned convict (William Powell) falls in love with a dying woman (Kay Francis) on board a cruise ship, his desire to escape from the clutches of his captor (Warren Hymer) suddenly becomes more complicated. Glamorous Kay Francis was one of the most popular and highly paid stars in early Hollywood, but because she made so few memorable films, she’s largely forgotten by movie buffs today. Along with her supporting role in Ernst Lubitsch’s Trouble in Paradise (1932), she’s probably best known for this three-hankie shipboard romance, which succeeds in large part due to the genuine chemistry between the two leads. Equally enjoyable is Aline McMahon as a kind-hearted con woman posing as a countess; unfortunately, her sidekick “Skippy” (Frank McHugh) — with perhaps one of the most annoyingly affected laughs ever heard on-screen — is nothing short of irritating. Indeed, whenever the film slides into overt comedy, the story falls flat — yet while One Way Passage can’t rightfully be called a classic, it remains worth a look simply to see Francis in her prime. Yes, simply to see Francis in one of her most memorable films. Listed as a film with historical importance and a Personal Recommendation in the back of Peary’s book. When a film (such as this) is a mere 67 minutes, it has a responsibility to pack a wallop – and this film doesn’t. For what it is, it’s not a bad film – but it feels like the kind which, decades ago, would have been on a double-bill with a better one. Watchable, a bit of a mish-mosh ultimately – and it ends on a spooky note (not that surprising).